Congratulations, Alex, Able Muse is the recipient of JoyZine's Wonderful Website Award for a beautifully presented site with a lovely, clean design and great graphics. A most impressive and creative use of graphics within the confines of the Internet. Your site has been approved for listing by SC Portal. Our standards are high. Acceptance distinguishes your site as one of the best in its category. Congratulations Alex, on winning the BT DESIGN Best Site AWARD! Your e-zine is not only graphically excellent but also entertaining, educative, full of information, objective and a must literary resource on the web. Congratulations on winning the Art Rose Award for Fine Art and A Beautiful Website! We have reviewed your beautiful site and found the artwork outstanding. You certainly deserve to be awarded for having created such a magical web site. Congratulations! 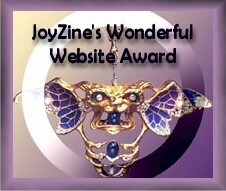 Your web-site has been reviewed and chosen to bear the 1999-2000 Golden Web Award. Your site has been listed as an "Award e-sweet"
You have won the Pegasus Web Award called - “Creativity Award for Artistic Excellence”! Pegasus awards are granted to exemplary and outstanding sites that stand out from the rest and are a positive contributions to the online community. On behalf of Visual Xtreme I’d like to present Able Muse with Visual Xtreme’s Gold award of excellence. Your positive contributions continue to make the web a better place to visit. Your site has won the "ArtPro of the Web Award" ... Your site is excellent! Keep up the good work!